We love filling hanging baskets for customers. A large range of herbs and pelargoniums can be put in our baskets. 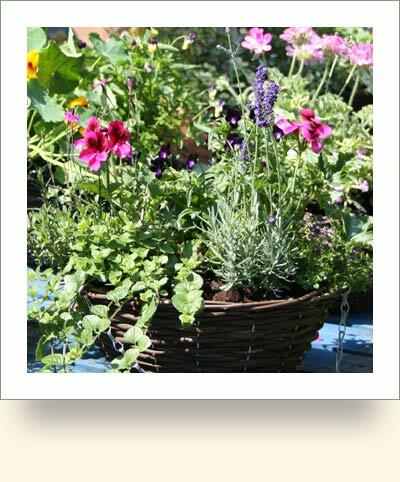 We usually fill with 5 herbs and 2 pelargoniums and the baskets are extremely good value, starting at just £14. Between May and August, we often have a range available to buy from the nursery but why not ask us to plant you one up while you wait or contact us to order before collection. and almost any of our Scented Pelargoniums!